Pre-Ordering the Aladdin Diamond Edition Combo Pack at Disneystore.com you get a set of 4 lithographs for free. These lithos are re-drawings on promotion material from back in the days the movie was in theaters. I’ve the complete set of those framed on my wall for many years. I could only find this old photo from like 10 years ago but since a few years I’ve put the set in one big frame with a nice golden/brass border. I remember that the Platinum DVD set from 2004 had this collectors edition with a booklet and a set of character sketches of the main characters by their supervising animators. Aladdin on Blu-Ray in the US is available to own October 13, 2015. y.
Illustator Kathryn Hudson sells posters of her Disney and other artwork at society6.com/. 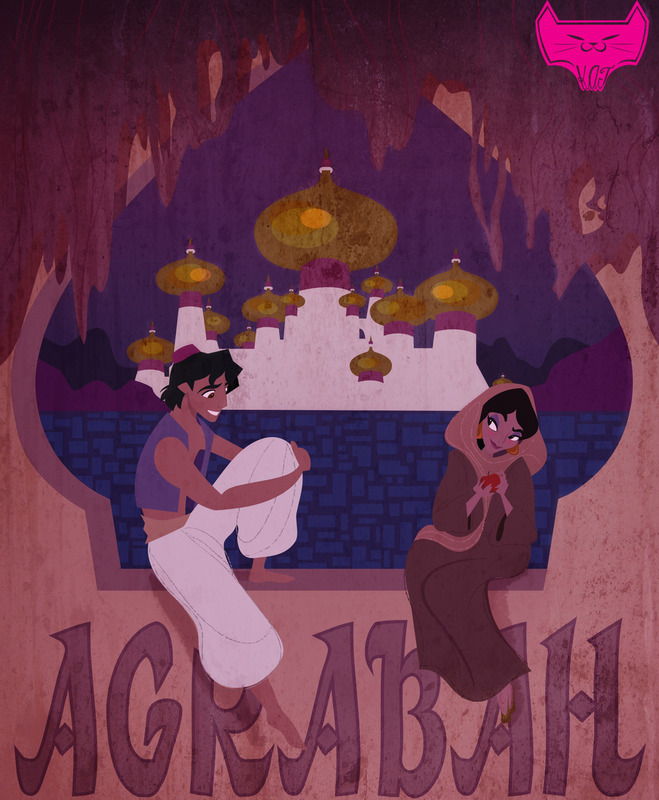 Other Aladdin artwork: I Can Open Your Eyes, Aladdin Wedding, Jasmine Nouceau and Jasmine Tattoo.